Launch is the entryway into life and relationships at CenterPoint. We want to provide an easily accessible entry point for experiencing and learning what it means to live and share a life-changing relationship with Jesus… together. Interested in learning more? Contact Ryan below. Being a part of CenterPoint is discovering what it means to be family together. Whether you are brand new and looking for a way to meet new people or you’ve been here for a while but haven’t been connected in a group or ministry team, Launch is great environment for you to discover and experience what it means to be family. With a blend of large group teaching and small group engagement, each week you will be inspired and equipped to take your next step in a life-changing relationship with Jesus. You will be encouraged to dig deeper into your faith and God’s wisdom, seeing your heart shaped to be more like Jesus’ heart. As you experience all of this and then go into the places where you live, work, and play you’ll start to see the way God wants to use you to share what He has given you with everyone else around you! You will be launched into a life of greater purpose and mission! We have three environments for you to choose from as you look to get connected. While each Launch is unique in some ways, they all create space for you to engage in large group teaching and small group discussion that will help catalyze your life-changing relationship with Jesus. Launch: Sunday Mornings. 9-10:10am. From September through May. Adults of all ages and stages of life. You can just show up and give it a try or contact us for more information. Launch: Women. Tuesdays, 6:30-8pm. Meeting weekly through most of the year with a brief break at some point during the summer. Launch: Men. Thursdays, 6:30-7:30am. Saturday, 7:30-8:30am. (each week, the sessions will be the same content on both days). Meeting weekly through most of the year with a brief break at some point during the summer. There may be some additional special events and connecting points throughout the year for each of our Launch environments. Check out our calendar for more information. 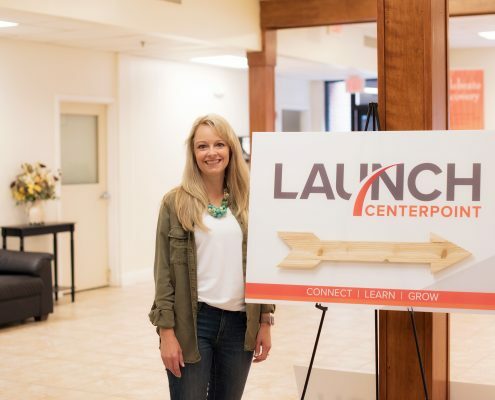 Launch is what we call our environments for connecting in life and relationships at CenterPoint. Through large group teaching and small group interaction, each participant will experience community and growth. No matter how long you’ve been a part of CenterPoint, if you’re not currently connected with a ministry team or group, give Launch a try. How many weeks will I attend Launch? That’s up to you! Each Launch environment is intended to create a space for new connections. We’d encourage you to try it out a few times before you make a final decision, but honestly you could just show up to try it once without any further commitment. Obviously, the more consistently you attend, the more easily you will make meaningful relationships. The environment is designed for people to come as consistently and frequently as they are able. What can I expect when I show up? Launch is intended to be a easy access point for people who are looking to get connected. You will find an engaging and welcoming leadership team that is ready to help you join a table group – a small group that will be your main connecting point through the meeting time and beyond. Whether live or through video, the larger group (made up of the collection of smaller table groups) will have the opportunity to be challenged, encouraged, and equipped through Bible teaching. The table groups will then discuss the teaching as it applies to their own lives. You will also have the chance to share about your own life and ways to pray for each other. What curriculum or materials are used for teaching? Each Launch environment has a leadership team that is responsible for determining the best teaching plan for their group. In general, the content is biblically focused and designed to help each participant live and share their life-changing relationship with Jesus in three particular areas: Identity, Character and Action. Each of these areas are informed by our understanding of our relationship with God the Father, Son, and Spirit. Why is it called Launch? The design of Launch is intended to help move you forward in your life-changing relationship with Jesus. Through your experience in Launch you will discover more about your purpose and the mission God has designed for you. That may mean you eventually are launched from this environment into a missional community that is living out nurturing their identity as family, developing their character as servants and taking action in their purpose as missionaries together. There is no specific timeline for when this will happen for each person, but we hope you’ll be sensitive and listening to how God may be calling you to live with others on mission in our world where we live, work and play. I’m already a part of a group or ministry team, should I join Launch? Anyone is welcome to join a Launch environment. Although, it is primarily intended to help connect people who are disconnected. 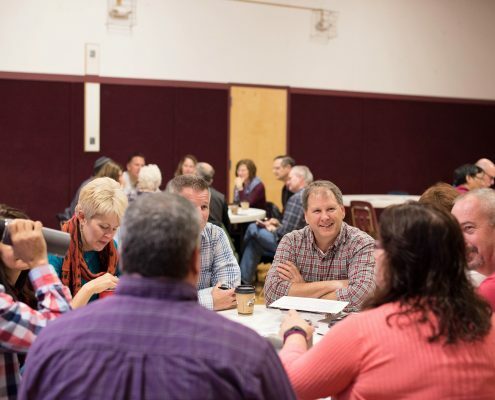 If you are already a part of a community group or ministry team, we encourage you to deepen your relationships and use your time to engage in mission with the people who are where you live, work, and play. Our hope is that what you are experiencing on your team or in your group will carry that same purpose and meaning in your life as what takes place in Launch.